The saying, “give a man a fish and feed him for a day; teach a man to fish and feed him for a lifetime” always rings true to me. Through raising my three children and coaching their sports teams, I always try to keep in mind that teaching them, instead of doing for them, impacts them for the better. They will remember these lessons for the rest of their lives. It takes a village to raise a child, and we as parents and mentors are responsible for preparing and educating them with the skills that they need in order to be prepared for the future. That is why I continue to coach, to have a positive impact on the lives of the kids in my community, and that is also why I teach adult education. Growth and development is not limited to kids, it is almost as rewarding to see ‘understanding and excitement’ in the face of a non-technical adult as it is to see the first hit in a game by a nine-year-old. Jeff Rutt, owner and founder of Keystone Custom Homes, as well as a client of mRELEVANCE, shares these same opinions on the necessity of educating people with skills they need in order to be successful. Jeff is passionate about both home building and helping those in poverty, thus he was inspired to found HOPE International, as well as Homes for Hope. Through these foundations, he brings the concept of “teach a man to fish and feed him for a lifetime” into reality. After traveling to Ukraine numerous times as a church delegate to transport food, clothing and medical supplies to those in need after the fall of the Soviet Union, Jeff realized that what the people really needed was a hand up instead of a hand out in order to live a sustainable life. During his time in Ukraine, he saw firsthand the local businesses that were struggling because they could not compete with the free hand outs from American charities. The population had become dependent on the supplies, therefore keeping them in a cycle of poverty. After his realization that the well-intentioned aid shipments were short-term fixes for the people in Ukraine and weren’t helping them rebuild their life, Jeff founded HOPE International; a Christian based microenterprise organization that provides small loans to hundreds of thousands of struggling entrepreneurs in 17 developing countries. HOPE provides training where they learn financial and business management skills before loans are given out. This gives them the knowledge that they need to become responsible business leaders and allows them to provide for their families. “I love building homes, but there is nothing more rewarding than building lives,” Jeff always says. 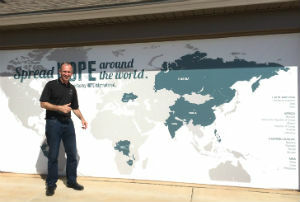 Jeff’s passion for home building and HOPE International led to the development of Homes for Hope. This non-profit organization allows local contractors in the US to build a Home for Hope on a largely pro bono basis. The net proceeds of these homes are donated to support the fight against global poverty. “With Homes for Hope, home builders are able to help transform somebody’s life on the other side of the world by doing what they do for a living right here,” Jeff explained. Since it was founded, Homes for Hope has generated more than $10 million in revenue to help eradicate poverty in developing countries. Like I said, it takes a village. Jeff has shown us all through HOPE International and Homes for Hope that when we teach people the skills they need, they can become successful. For more information about Jeff Rutt, visit www.jeffrutt.com.